Back Pain – Is Duloxetine (Cymbalta) Really a Contender?-And What About Knee? In a Quebec analysis (if one looks is actually the drug company’s), it has been suggested that Duloxetine might be more cost effective for patients over 65 where the heart disease and stomach bleed risks of NSAID arthrtis pill might be too great. However Clinically significant help of Duloxetine has been questioned. The Cost-Effectiveness of Duloxetine in Chronic Low Back Pain: a Quebec Societal Perspective. Wielage R, Bansal M, Wilson K, Klein R, Happich M. Affiliations: 1Medical Decision Modeling Inc. 2Eli Lilly Canada 3Lilly Deutschland GmbH. “Duloxetine is a selective serotonin and norepinephrine reuptake inhibitor which has demonstrated analgesic effects in two CLBP randomized controlled trials (RCTs) and an effect approaching statistical significance in a third 17–19. They reference 3 studies on use of duloxetine in back pain – all produced by the company involved. 18. Skljarevski V, Desaiah D, Liu-Seifert H, et al. 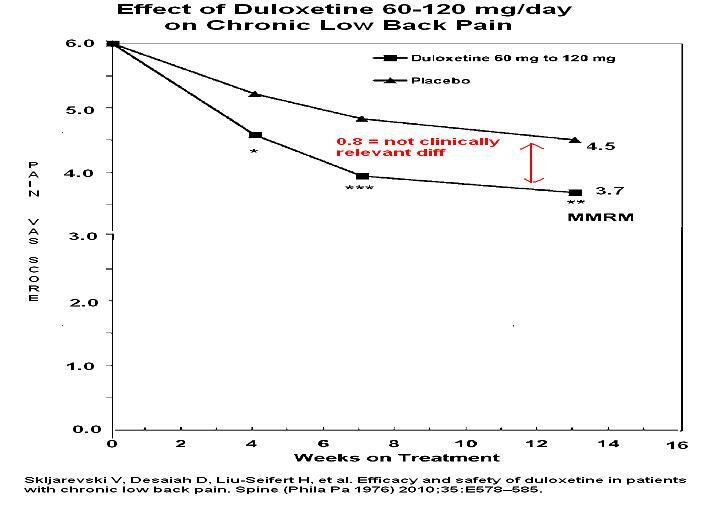 Efficacy and safety of duloxetine in patients with chronic low back pain. Spine (Phila Pa 1976) 2010;35:E578–585. Skljarevski V, Desaiah D, Liu-Seifert H, et al. Efficacy and safety of duloxetine in patients with chronic low back pain. Spine (Phila Pa 1976) 2010;35:E578–585. Addendum – you probably have not heard much from manufacturer on abilities of cymbalta. This is perhaps because a lesson was learnt by manufacturers of original lyrica and gabapentin. Both had to pay big fines for overstating their product. FDA requires a drop of VAS of >1 to be clinically relevant. 0.9 doesn’t do that for back pain overall. What about knee pains? So duloxetine at least in these studies (using postherpetic neuralgia cases is cheating because most will respond well to anything) could NOT achieve the golden goose of decreasing pain Visual Analog Scale by over 1/10 over placebo. How do they get mention? Because they spend great efforts going over subgroup analysis – giving you results of “responders”. This entry was posted in Back Pain, Depression. Bookmark the permalink.